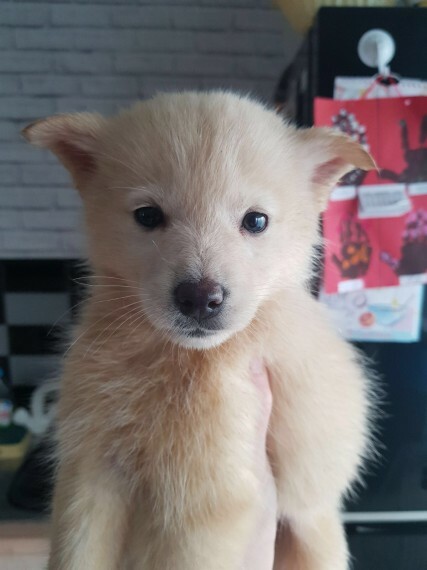 Beautiful F1 Pomsky For Sale! A beautiful pomsky who is now 11 weeks old has had her first injections. She is a lovely puppy who has been brought up around children. We are putting her up for sale as we are not home a lot of the time and so taking care of her is difficult. We have all the puppy equipment that is included in the price ( bed, toys, puppy snacks, bowls, brush, nail clipper, dental care, lead, collar, travel bag etc ) She has been wormed and flead and is a wonderful dog! If there are any questions feel free to call or email. Adopting, or buying a new puppy or dog is an important decision and big responsibility. As an owner, you will solely responsible for the welfare of your new pet and will also be financially committed. Before you decide to buy or adopt you must ensure that you’re 100% committed beforehand. For further information on caring for puppies and dogs, please visit our pet advice section. You can also find out more information about the Pomsky breed by visiting the Pomsky Dog Breed Information.